The other day, my good foodie friend, Grace, came over for dinner. Every few weeks, we get together to talk about what’s rocking our foodie worlds and discuss other bits of life. Our dinner date menus come to fruition when each of us assesses our fridge situation and sees what we have lying around. We text each other our ingredients and come up with a dish. It’s like Chopped, but a whole lot less intense. This past dinner, she brought over zucchini, corn, and onions, and with my cilantro, jalapeño, goat cheese, and homemade pizza crust, we made some killer grilled pizzas. As far as the pizza goes, I'll leave her to fill you in. She’s an amazing photographer (who just so happened to shoot our wedding), so she took photos of our pizza-making in action. The base of the pizza, however, was this cilantro pepita pesto, a refreshing twist on traditional basil pesto. 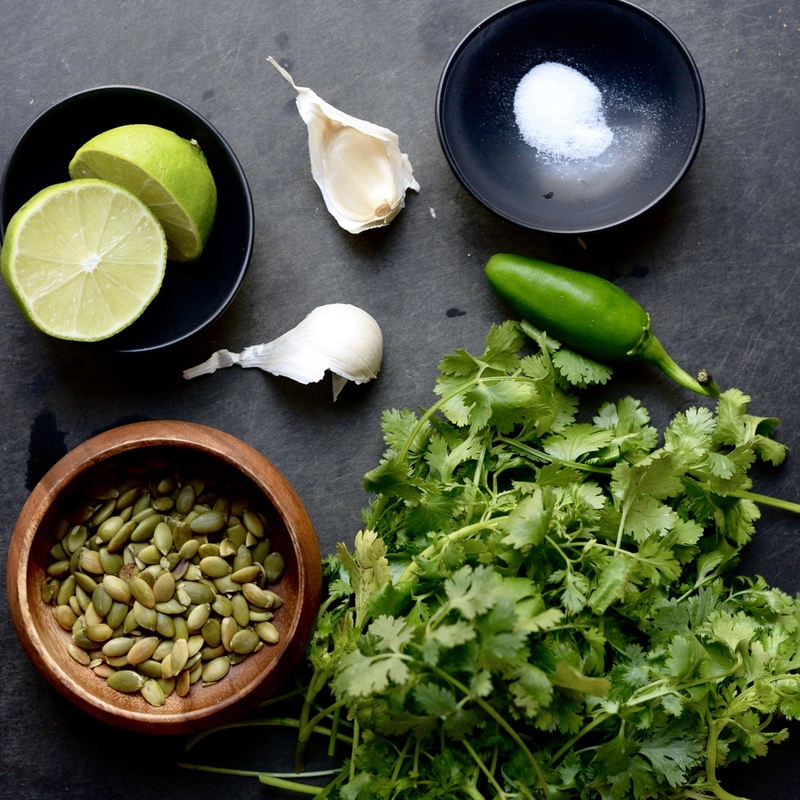 I used cilantro instead of basil, toasted pepitas (pumpkin seeds) instead of walnuts, lime instead of lemon, and jalapeño for a little fiery kick. Because we were just throwing things together, I didn’t measure anything, but of course regretted it because it was definitely a keeper. I told Grace (and myself) to make it again, this time measuring for posterity’s sake. 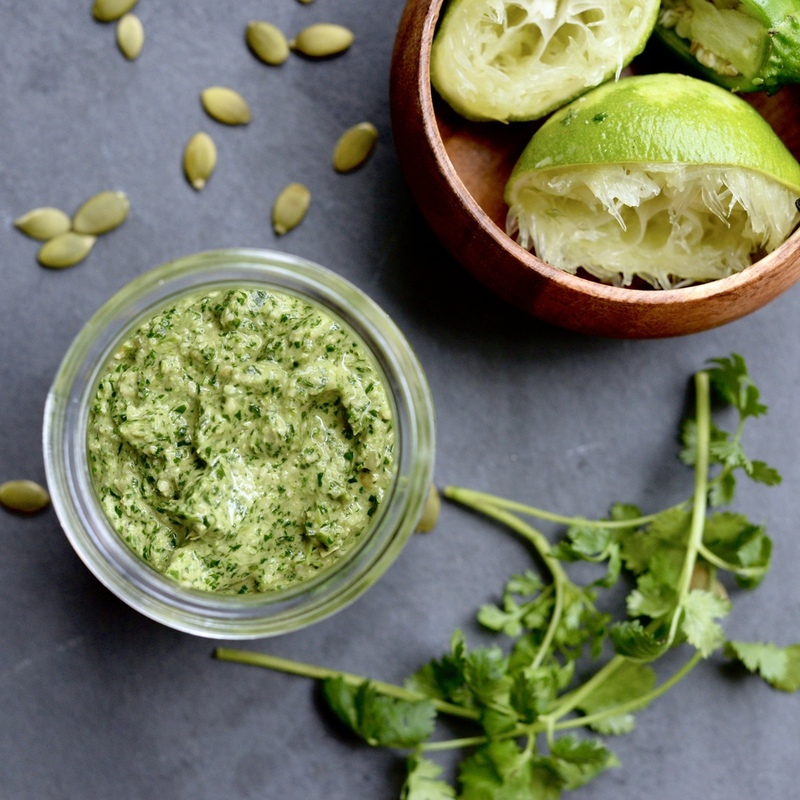 Although that grilled pizza is most definitely in the summertime round-up, I wanted to highlight the versatility of this herbaceous, bright, and wee-bit spicy pesto by drizzling it on something different. Considering it played so well off the sweet corn on the pizza, I paired it with just-ripe local peaches that I drizzled with a little olive oil and popped on the grill. Peaches that are too juicy won’t hold up in the heat, so make sure you’re using firmer peaches. 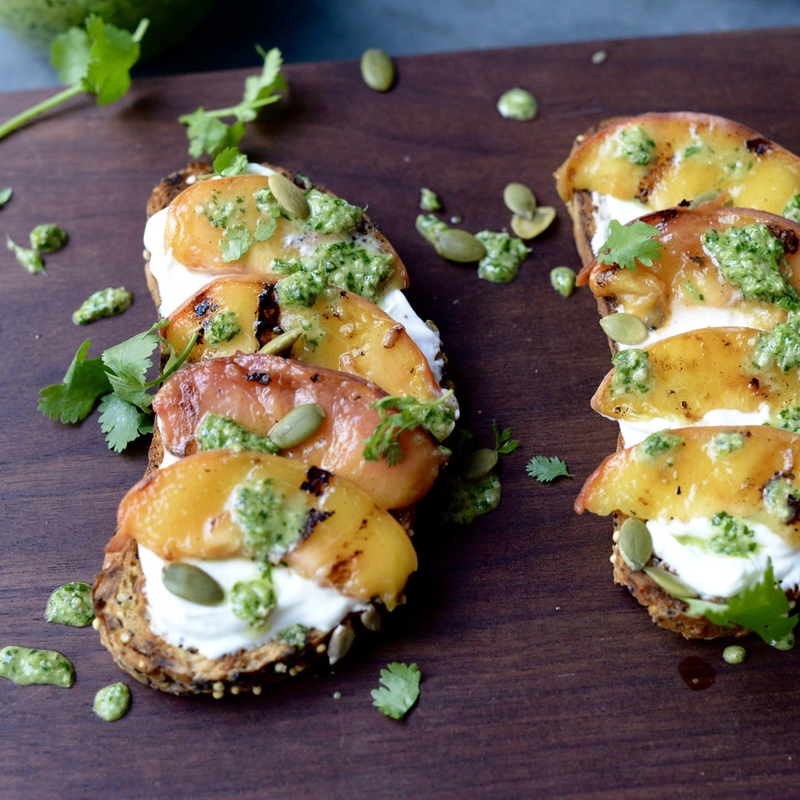 I grilled some bread for the base as the peaches were going, slathered on some crème fraîche (although goat cheese would be fantastic here), and drizzled on the pesto to make a delicious summer bruschetta that rivals the tomato and mozzarella standby. This recipe is super duper easy, and the fact that you don’t even have to turn on your oven (or stove) makes it a summer winner in my book. Add everything to a food processor or blender, and blend until smooth, scraping down sides as necessary. Add salt and pepper, to taste. Makes about ½ cup. Grill peaches and bread. Heat grill to medium. Allow to preheat for 10 minutes. 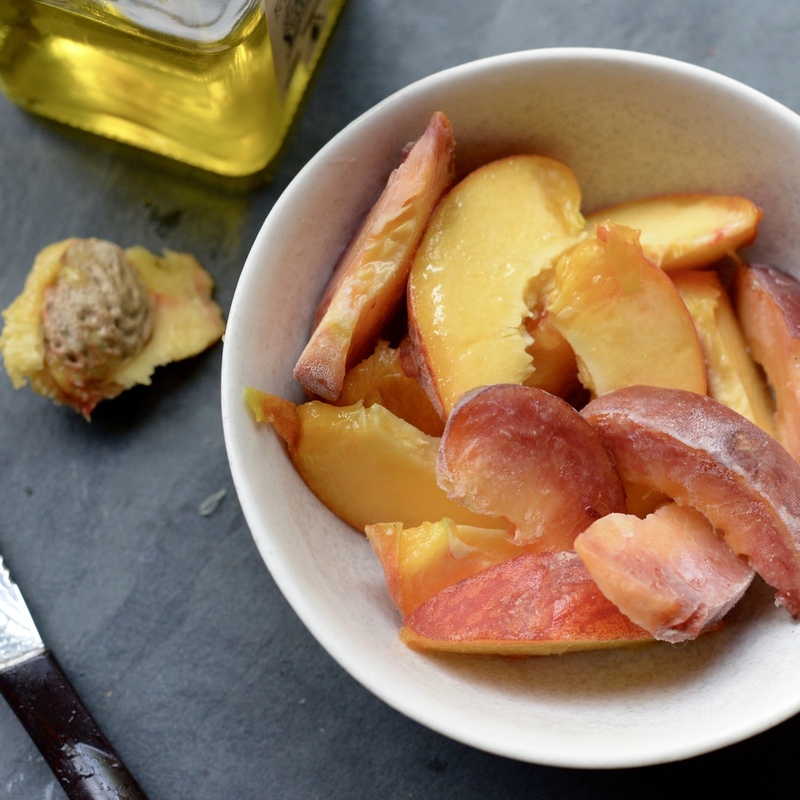 Toss peach slices with olive oil. 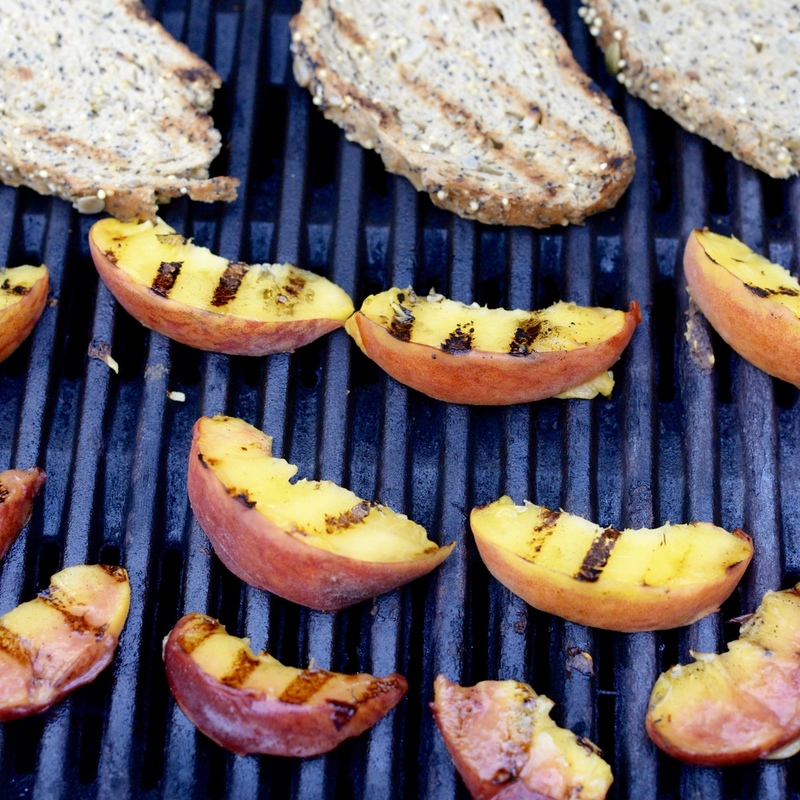 Place peach slices and bread on grill. Grill peaches 1 minute on each side or until just soft. You want to get grill marks on the peaches, indicating caramelization and allowing the sweetness to come out, but you don’t want the peaches to become mushy. Remove from heat when done. Grill bread, about 2-3 minutes per side. Assemble bruschetta. Spread each slice grilled bread with 2 tablespoons crème fraîche. 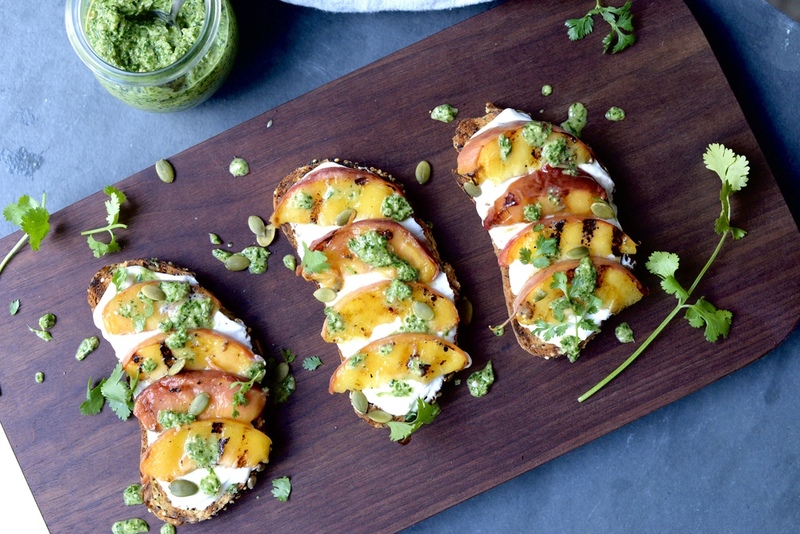 Add peach slices to cover and drizzle with a tablespoon or two of pesto. Sprinkle with sea salt to finish and serve. Enjoy! Makes 4 slices or 2 servings. *You can use smaller baguette rounds, reducing the amount of topping on each, for party crostini. Hi! I'm Emily. 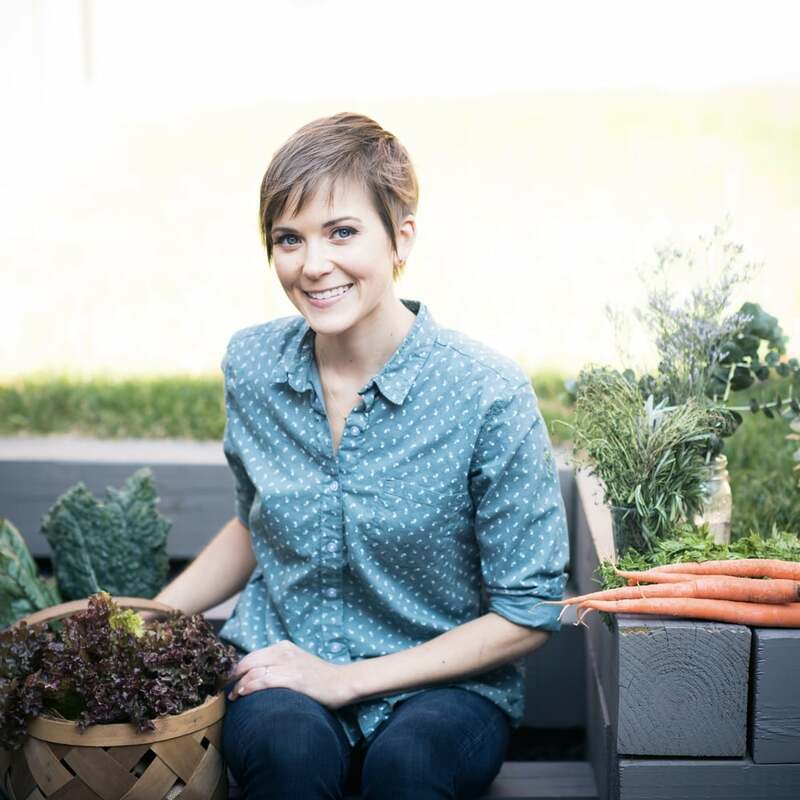 I love to cook whole, nourishing foods, and this is where I share my kitchen experiments and sometimes a little bit of life. All photographs, recipes and content are property of Nourishing Matters, unless otherwise noted. Please do not redistribute without my permission. Thank you!